Welcome to Midlands Wing Chun Training. Wing Chun Training needs to be structured in order that you make gradual progress in a manner that not only makes sense, but brings personal reward too. Here we will lay out the structure of OUR training classes in order that YOU can more easily understand the journey ahead in YOUR progression toward mastering the Art of Wing Chun Kung Fu. In order to ensure that YOU as students get the most from our classes throughout your journey through the Wing Chun system we have developed a three-tier approach to our classes. We do not mix classes and you will not be going backward and forward constantly as new student wish to join. You will always be moving forward. Any student of a higher level can train in classes below the level they have achieved. They can then continue to review basics, whilst at the same time are able to help and inspire the less able students. Less experienced students are simply not allowed to train in the more advanced classes. YOU will be welcomed into our dedicated Beginners Class and introduced to the simple but highly effective theories of the Wing Chun Kung Fu system. We focus your training from the very first lesson, building a solid understanding of self-defence scenarios, ensuring that YOU have the skills and ability to feel confident in confrontational situations, learning how to overcome not only the physical, but also the psychological barriers involved in effective Self-Defence. Basic concepts of the Centre Line, Economy Of Motion and Developing Close Range explosive short distance power are covered extensively. Blindfolded tactile responses are also introduced and honed, culminating in our Preliminary Grading. 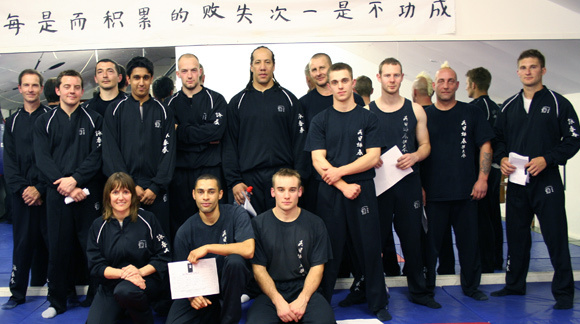 The grading requires students to demonstrate a good understanding and ability in practical self-defence techniques as well as striking and footwork skills. We firmly believe that this can be reached within a 4-5 month period of dedicated training and practice, alongside expert tuition.